How do we explain the impossible? Miracles From Heaven is based on the incredible true story of the Beam family. When Christy (Jennifer Garner) discovers her 10-year-old daughter Anna (Kylie Rogers) has a rare, incurable disease, she becomes a ferocious advocate for her daughter’s healing as she searches for a solution. After Anna has a freak accident and falls three stories, a miracle unfolds in the wake of her dramatic rescue that leaves medical specialists mystified, her family restored and their community inspired. To buy the film, head here. To see Sight's review, head here. To enter, simply tell us in 50 words or less what your favourite inspirational film is and why. Send entries to editor@sightmagazine.com.au with 'Miracles Competition' in the subject line. As well as your answer, please include your name and postal address. Entries close 5pm on 18th July, 2016. The two winners will each receive a copy of the DVD, Miracles From Heaven. Competition open to Australian residents subscribed to Sight's email weekly updates as at 5pm on 18th July, 2016. To subscribe click here. TERMS AND CONDITIONS: Competition, conducted by David Adams, editor of Sight Magazine, runs from 12.30pm on 6th July, 2016, until 5pm, 18th July, 2016. Only open to Sight subscribers as at 5pm on18th July, 2016. Only open to Australian residents. Not open to regular Sight contributors. Only one entry per subscriber. The two winners will be announced on Sight (first initial and last name along with suburb of residence) and notified by email. 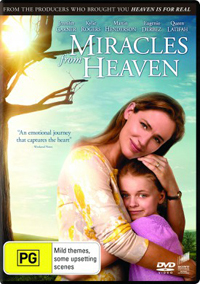 Prizes, which will be sent via post to address provided, consist of two copies of the DVD, Miracles From Heaven.